Sunflowers are my favourite flower they remind me of summer and always look so cheerful. I have coloured with Spectrum Noir pens and kept the image quite large to fill my card blank. I added glitter to the wings of my butterfly and also to the centre of the sunflower. Teal ribbon and vintage lace were the finishing touches for my card. A simple design and a quick card to make, I wanted to allow this beautiful image to be the star. WOW, this is so nice! I love everything about it and how you colored my image. Thanks for joining us at Pattie’s Creations Design Challenge. Thanks for playing in our "Mother's Day or Flowers" Challenge #122! Congrats on your win of 2 images (excluding sets) in Challenge #122 from Pattie's Creations! Make sure you stop in the challenge blog to email Pattie with your image choices within 7 DAYS. Her email info is on the sidebar. Also grab the 'I Won Badge'. 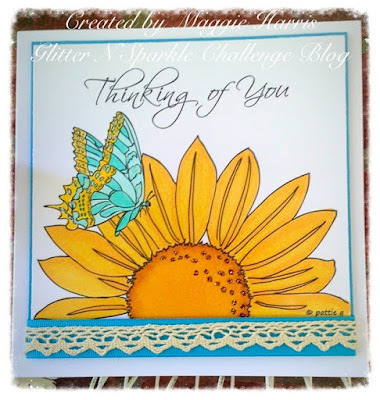 Great card - thanks for joining us at Pattie's Creations Challenge.